හස්ති පක්ෂියා අභාවයට ගිය පියාඹීමට නොහැකි කුරුල්ලෙකු විය.මෙම පක්ෂීන් ගේ ජන්ම භුමිය මැඩකස්කර් දූපත්විය..
17 වන සියවස දක්වා මෙම පක්ෂින් මැඩකස්කරයේ විසූ බව දැක්වේ.ප්‍රංශ ජාතික ආණ්ඩුකාරවරයෙකු වූ එටිනේ ද ෆ්ලැකෝ(ර්)ට් නම් ගේ වර්ථාවල මෙම වීශාල කුරුල්ලා පිළිබද විස්තර ඇතුලත් වේ.එසේම සුප්‍රකට දේශ ගවේශක මාර්කෝ පෝලෝ ගේ දේශාටන වාර්ථාවලද මෙම පක්ෂියා පිළිබද විස්තර ඇතුලත්ය.මෙම පක්ෂියා මීටර් 3 පමණ උසින් ද කිලෝ ග්‍රෑම් 400 kg පමණ බරින්ද යුක්තවී ඇත. මෙම පක්ෂියාගේ බිත්තරයක පරිධිය මීටරයකට වඩා තරමක් වැඩිය.බිත්තරයක දිග සෙන්ටි මීටර 34 කි.. සමාන්‍ය කුකුළ් බිත්තරයකට වඩා 160 ගුණයකින් මෙම බිත්තරය විශාල විය. මොවුන් බොහෝවිට තාල වර්ගයට අයත් ශාක ඵල ආහාරයට ගෙන ඇත.සර්පයින් පළතුරු ආදී ආහාර වර්ග ඔවුන්ගේ ආහාර වන්නට ඇතිබව විශ්වාස තරයි. හස්ථි පක්ෂියාට අයත් යැයි විශ්වාස කෙරෙන බිත්තර කැනරි දූපත් වලින් සොයාගෙන ඇත. මෙම දූපත් ඍජුව අප්‍රිකානු මහද්වීපයට සම්භන්ධවී නැත.මොවුන් මුහුදු මට්ටමින් එතරම් උසින් අඩු වෙරළාසන්න භූමින්හි සැරිසරා ඇත.අප්‍රිකාව මැඩගස්කර් දූපත් ආශ්‍රිතව වෙරළාසන්න පෙදෙස්වල පමණක් මොවුන්ගේ ෆොසිල හමුවී ඇත. මානව ක්‍රියාකරකම් වලට අමතරව අප්‍රිකානු කලාපයේ පැතිරගිය වසංගත රෝගයන්ට ගොදුරුවීම නිසාද මොවුන් විනාශවී ඇත.ඇතැම් පක්ෂි ෆොසිල අධ්‍යනයේදී වසංගත රෝග නිසා මියගිය පක්ෂී ෆොසිල බහුලව සොයාගෙන ඇත.මෙවැනි වසංගත හස්ථි පක්ෂීන්ටද පැතිර යන්නට ඇතැයි සිතිය හැක. Aepyornis maximus යන විද්‍යාත්මක නාමයෙන් හඳුන්වන හස්ථි පක්ෂියා ඉංග්‍රීස් බසින් 'elephant bird', යන නමින් හඳුන්වයි.මෙම නාමය දේශ ගවේශක මාකො පොලෝ විසින් හඳුන්වාදුන් වදනකි.ඇතකු වැනි විශාල කුරුල්ලකු දුටු බව ඔහු ලියා ඇත. අතීත දේශ ගවේශකයන්ගේ සටහන් අනුව මෙම පක්ෂියාගේ බිත්තර මැඩගස්කර් දූපත් අසල දී හමුවී ඇත. Occasionally the subfossilized eggs are found intact. The National Geographic Society in Washington holds a specimen of an Aepyornis egg which was given to Luis Marden in 1967. The specimen is intact and contains the skeleton of the unborn bird. The Denver Museum of Nature and Science (Denver, Colorado) holds two intact eggs, one of which is currently on display. Another giant Aepyornis egg is on display at the Harvard Museum of Natural History in Cambridge, MA. A cast of the egg is preserved at the Grant Museum of Zoology at London University. David Attenborough owns an almost complete eggshell, dating from 6-700 CE, which he pieced together from fragments that were given to him while making his 1961 BBC series Zoo Quest to Madagascar. In March 2011, the BBC aired the 60 min. documentary Attenborough and the Giant Egg, presented by Attenborough, about his personal scientific quest to discover the secrets of the elephant bird and its egg. 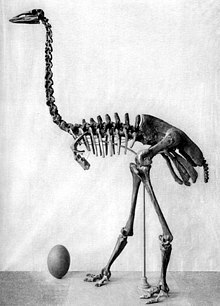 There is also an intact specimen of an elephant bird's egg (contrasted with the eggs from other bird species, including a hummingbird's) on display at the Delaware Museum of Natural History, just outside Wilmington, Delaware, USA, and another in the Natural History Museum, London, England. The Melbourne Museum in ඕස්ට්‍රේලියාව has two Aepyornis eggs. The first was acquired for 100 pounds by Professor Frederick McCoy in June 1862, and is an intact example. In 1950 it was subjected to radiological examination, which revealed no traces of embryonic material. A second, side-blown Aepyornis egg was acquired at a later date. The Rukh is known from Sindbad the Sailor's encounter with one in "One Thousand and One Nights". Some scholars think the Roc is a distorted account of the Aepyornis. Historical evidence for this can be found in Megiser (1623). H.G. Wells wrote a short story entitled "Aepyornis Island" (1894) about the bird. It was first collected in The Stolen Bacillus and Other Incidents (1895). Wildlife artist Walton Ford created a painting called "Madagascar" about the Elephant Bird in 2002. ↑ 17.0 17.1 Attenborough and the Giant Egg. BBC. 2011-03-02. Retrieved on 2011-07-24. ↑ R.T.M. Pescott, 'Collections of a Century: The History of the First Hundred Years of the National Museum of Victoria, National Museum of Victoria, 1954, p.47. BBC-2 Presents: Attenborough and the Giant Egg. Presenter: David Attenborough; Director: Sally Thomson; Producer: Sally Thomson; Executive Producer: Michael Gunton. BBC. BBC Two. March 2, 2011. Brands, Sheila J. (1989). "The Taxonomicon : Taxon: Order Aepyornithiformes". Zwaag, Netherlands: Universal Taxonomic Services. සම්ප්‍රවේශය 21 Jan 2010. Brodkorb, Pierce (1963). "Catalogue of Fossil Birds Part 1 (Archaeopterygiformes through Ardeiformes)" (PDF). Bulletin of the Florida State Museum, Biological Sciences. Gainesville, FL: University of Florida. 7 (4): 179–293. Davies, S. J. J. F. (2003). "Elephant birds". in Hutchins, Michael. Grzimek's Animal Life Encyclopedia. 8 Birds I Tinamous and Ratites to Hoatzins (2 ed.). Farmington Hills, MI: Gale Group. pp. 103–104. ISBN 0 7876 5784 0. Goodman, Steven M. (1994). "Description of a new species of subfossil eagle from Madagascar: Stephanoaetus (Aves: Falconiformes) from the deposits of Ampasambazimba". Proceedings of the Biological Society of Washington (107): 421–428. Mlíkovsky, J. (2003). "Eggs of extinct aepyornithids (Aves: Aepyornithidae) of Madagascar: size and taxonomic identity". Sylvia. 39: 133–138. van Tuinen, Marcel; Sibley, Charles G.; Hedges, S. Blair (1998). "Phylogeny and Biogeography of Ratite Birds Inferred from DNA Sequences of the Mitochondrial Ribosomal Genes" (PDF). Molecular Biology and Evolution. 15 (4): 370–376. Yoder, Anne D.; Nowak, Michael D. (2006). "Has Vicariance or Dispersal Been the Predominant Biogeographic Force in Madagascar? Only Time Will Tell". Annual Review of Ecology, Evolution, and Systematics. 37: 405–431. doi:10.1146/annurev.ecolsys.37.091305.110239. මේ පිටුව අන්තිමට සැකසුවේ 27 දෙසැම්බර් 2017 දින දී, 10:32 වේලාවෙහිදීය.